S W A L L O W | The blog of record on the painkiller addiction epidemic. —by Brian G.
The blog of record on the painkiller addiction epidemic. —by Brian G.
I have been unable to post for quite some time, for some personal and legal reasons, which I will be writing about very soon. Also, I have been unable to update many of the links on this blog. Those whom I have corresponded with, I hope that you will keep in touch. I will be back soon … somewhere. Thanks to everyone who has contacted me for all of your support. Not Another Sequel! 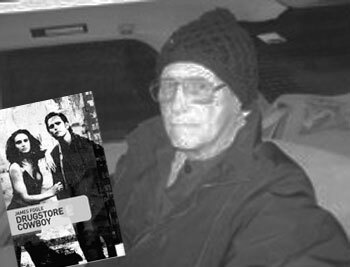 “Drugstore Cowboy” Author James Fogle Arrested for Pharmacy Robbery (Again). Apparently Fogle and another man were caught mid-spree trying to liberate what has been described as “garbage cans full of drugs” from a Redmond (Washington) pharmacy. For those who may not know (really? ), James Fogle wrote what would become the critically acclaimed “Drugstore Cowboy” from his California prison cell in the 1970s. The book achieved some critical acclaim, and was later (in 1989) adapted for the silver screen by none other than Gus Van Sant. I’m trying to decide what will be sadder, James possibly spending the rest of his life in prison, or the media using this story to obfuscate and confuse the recent surge in pharmacy robberies, which is fast-becoming one of the most serious aspects of the Painkiller Epidemic. See… now this is something. I am not going to get into too many details right now (I will get into them here soon), but there are so many holes in the way Opiate/Opiod Prescription Painkillers (and prescriptions in general) are filled by pharmacies that it’s down-right embarrassing. You will meet more resistance cashing a payroll check at your average bank than you will filling a prescription for a powerful narcotic at most pharmacies. Where to begin? Let’s see… Most pharmacies will not check your ID. They rely on “pharmacy technicians” too heavily. And the DEA numbers that pharmacists and pharmacy technicians count on to demonstrate “authenticity”… are a cruel joke. 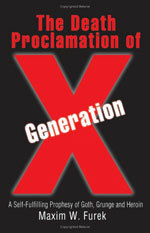 Win a copy of The Death Proclamation of Generation X by Max Furek! To launch the new SWALLOW Blog facebook page, I’m announcing our first Book Giveaway (More to come!). To win this one, “The Death Proclamation of Generation X: A Self-Fulfilling Prophesy of Goth, Grunge and Heroin” by Max Furek, just join the SWALLOW Blog facebook page by 5/15. All you have to do to be eligible is click on the facebook badge in the right-hand column of this site, or follow this link to facebook, and join/follow my page on facebook… by May 15th, 2010.